If you want eco-friendly and visually appealing outdoor features, opt for permeable pavers. AAA Pavers, Inc. has been installing these environment-friendly paving materials for clients in North Palm Beach, Palm Beach Gardens, and Jupiter. Contact us today and let us help you realize your dream outdoor amenities by using a practical alternative to traditional pavers. Nature friendly – These materials are known to allow rain and storm water to seep through and replenish water underground. Storm water reduction also prevents toxic pollutants from finding their way into streams, rivers, and other bodies of water. Reduction of local heat island effect – Unlike concrete and asphalt surfaces, permeable pavers do not contribute to heat buildup in cities and local communities. Instead, these pervious materials effectively help reduce the phenomenon called local heat island effect, hence making the immediate surroundings cooler and more inviting. Great savings – Many property owners in North Palm Beach, FL are not aware that pervious materials actually have some wonderful economic benefits. First is that they help contractors and property owners save on drainage and retention systems. It is also proven that using them can help owners of private residences and commercial properties save money on compliance to regulations. 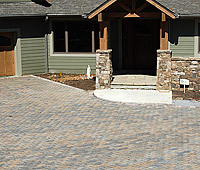 Aesthetic boost – There is a wide variety of permeable paver options that clients like you may choose from. These choices come in various shapes, sizes, textures, colors, and patterns that altogether allow for highly custom appeal. With us, you can look forward to having paver structures that will make your outdoors stand out aesthetically. Permeable pavers are versatile materials that can be used in a lot of areas around residential, commercial, or public properties. They can be used in driveways, playgrounds, parking lots, pedestrian lanes, sidewalks, garden steps, and pathways. It is also possible to use them to create pool decks, jogging paths, garages, and many other outdoor structures. We use Aqua Bric and Uni Eco-Stone for our pervious paving projects. These permeable pavers offer some truly awesome practical benefits and aesthetic qualities that help us satisfy clients with discriminating taste. Aqua Bric – This paver brand offers the look of a New England manor that is perfect for any property with a classical theme. The available patterns include running bond, basket weave, and 45-degree and 90-degree herringbone. They are ideal for high-traffic and high-load-bearing areas like driveways and even meet the architectural guidelines under the Americans with Disabilities Act. Uni Eco-Stone – This eco-friendly paver also comes in herringbone, basket weave, and running bond patterns. It is the pioneering permeable paver brand in North America and has long been favored by many landscaping contractors and property owners for its excellent storm water reduction capabilities and high-load-bearing capacity. 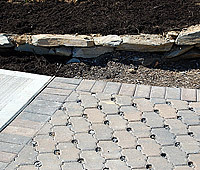 AAA Pavers, Inc. has the experience and necessary training in installing permeable pavers. We are ICPI certified, so we can install these excellent paver materials the right way and with 100 percent positive results. Best of all, we help our North Palm Beach clients and other property owners in nearby cities save money by offering very affordable rates. Call us at (561) 284-9834.